Now, Gruber has been subpoenaed again by the House Oversight Committee, this time in relation to his work and the income he earned as an Obamacare advisor. However, the subpoena covers all documents and exchanges with government employees, including work product, the results of economic model simulations, and any communications related to contracts and the funding of his research. Poor Gruber is in hot water. Lying to Congress, if that charge were pressed, could earn him up to five years in prison. “Shouldn’t that mean that Gruber knew that administration’s repeated promises that those who like their health plans could keep their plans under the law weren’t true? 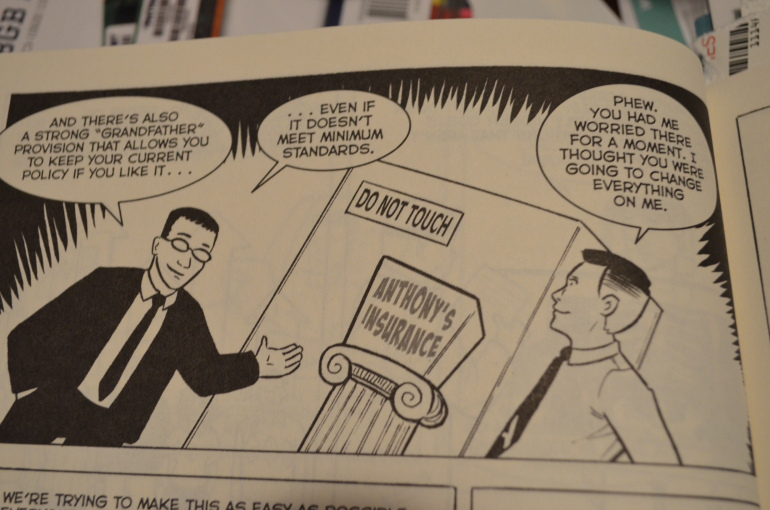 In fact, on the question of lost coverage, Gruber’s own comic book on the ACA made the same assurances as the Administration. See the frame at the top of this post! More contradiction. Another crucial point is that Gruber claimed to have written the part of the ACA related to state health insurance exchanges. He stated on multiple occasions (captured on video) that the federal health insurance subsidies created by the ACA were intended as incentives for states to create their own exchanges. The “plain language of the law” is consistent with that claim; it is explicit in providing for subsidies only when a policy is purchased through a state exchange, not a federal exchange. Next year, the Supreme Court will hear the case King vs. Burwell, which turns upon whether the law itself disqualifies ACA insurance buyers in 36 states from collecting federal subsidies. Gruber’s videos appear to be quite damaging to the government’s case.